There is a new cycling path from Lewes and the Egrets Way to the South Downs- or is there? It can be hard to make a living from farming these days, so when Iford Farms, proposed some holiday lodges at Swanborough, there was little opposition, particularly since they were offering to a build a multi use off road route near past the lodges which would enable cyclists and others to avoid a stretch of the C7 and would also enable them to go from Lewes to the South Downs above Swanborough without going on the busy road. The route leaves the Egrets Way opposite Springbarn Farm (point A on the map) and then runs behind the garden centre to Swanborough Drove(B), where it turns right up Swanborough Drove, a paved track. 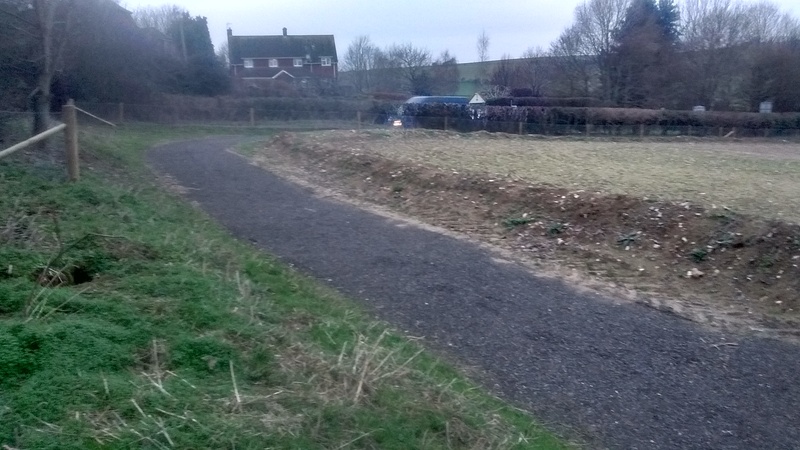 It was then supposed to turn left before the drove met the C7 Lewes- Newhaven road (C), to a safer road crossing just to the south, opposite another farm track. The route would then go up the farm track to the west of the C7 and then turn south to join an existing bridleway going up to the Downs. This route was put forward as a community benefit in return for permission to build the lodges,. So when the lodges got planning permission in February 2018 it was made a condition that they should not be occupied until the new route was open. Meanwhile a planning application had been made for the new cycleway. Initially it appeared that it might be an equestrian route too, but this appears to have been abandoned. Although nearly everyone was in favour of the route in principle, a number of bodies had concerns. East Sussex Hiighways said that they did not have enough information about the road crossing at Swanborough to agree it. The highways team, the East Sussex rights of way team, local district council member Vic Ient and the Open Spaces society were concerned about the width of the route which was only intended to be 1.5metres. The rights of way team and the Open Spaces society were concerned about whether the route was going to be a public right of way or not. The route was widened to two metres, which is still not much for a route shared between pedestrians and cyclists, but the planning authority, the South Downs National Park Authority, seems to have ignored concerns about whether the route was to be a right of way or not, and failed to require a route across the C7 to be agreed with East Sussex highways before planning permission was granted. Planning permission was granted in June 18 in good time to get the work done in the good weather of the summer and autumn. The permission did say that the route should not be opened until the crossing of the C7 was agreed. Poor old equestrians were limited to a new dead end bridleway running north from Swanborough farm between points D and E on the map, which was of no use at all. No route across the C7 has been agreed. East Sussex Highways is not responding to enquiries about how they are progressing this issue. By the end of 2018 a route of sorts had been constructed between Springbarn Farm and the new lodges. It is just about rideable on a bike but the top layer of limestone has not been added, making it a rough ride. The picture below shows the current state of the route. The new crossing at point C on the map has not been constructed so users have to go to the end of Swanborough Drove and then pass along a short bit of the C7, not particularly safe. The route west of the C7 is already hard surfaced, so does not need any improvement. The crossing of the C7 has not been agreed. 1) The planning permission for the cycle route says it may not be opened until the crossing of the C7 is agreed. 2) The planning permission for the lodges says that they are not to be occupied until the cycle route is open. So obviously the lodges cannot be occupied can they? According to the Hoseasons web site they are available at prices ranging between £605 and £1465 per week. The reviews, which refer to lettings as early as early October 2018, suggest that they are very popular. The South Downs planning enforcement officer is apparently investigating. Perhaps the Park Authority might have done better to have been clearer at an earlier stage about the status of the new route, and the requirements of the crossing of the C7. There seems to be little incentive for East Sussex Highways and Iford Farms to come to a speedy agreement. SO IS THE CYCLE ROUTE OPEN? Nearly all the cycle route is open and available to use. It is “not open” in the way that the lodges are “not occupied”. The surface is, however not what you might wish for. It is a peaceful (if somewhat longer) route for those cycling between Lewes and Newhaven, and a good link for people wanting to cycle or walk from Lewes to the South Downs. Just be careful when traversing the C7.